The moment a child enters the school gates the child is the concern of the school authorities. Whether the school has begun or not, or staff members are in or out, a proper mechanism should be put in place to safeguard and protect children while they are within the perimeters of the school, Dr.Ayesha Lokubalasooriya, who is in charge of the School Health Unit of the Family Health Bureau in an interview with the Sunday Observer said. She said schools cannot shirk that prime responsibility. We must keep in mind that just as looking after the discipline of students -their safety is equally important. Everyone takes pains to ensure that children adhere to school disciplinary norms, prefects and staff members check the hair (even those of the very young children), dress code and finger nails, While this is commendable, safety of children cannot be relegated to a back seat. The child may have to live his entire life with a permanent disability suffered during his young days in school. Schools must ensure that students' safety is their number one priority and that this should not be compromised under any circumstances. Having said that, fatal or grievous accidents in our state schools are common. We must congratulate the school authorities for maintaining such standards. However, if the turf roller at Ananda College was properly secured, the unfortunate death of the nine- year- old could have been averted. Now following such a tragic accident, chances are that parents and teachers will prevent children from engaging in physical activity, sometimes it maybe to protect them or to avoid being blamed. This is not a good thing and will have repercussions. Children should be allowed at least one hour's play activity during school time for sound physical and mental development. The best time for that is before school and during the break. Being paranoid about safety will not help the child's well-being. During our time, when there was a free period the class teacher or a relief teacher let us play. This practice is long gone in an era where academic activities has superseded every other aspect of school. It is conveniently forgotten that play is a child's basic right. Restricting young children to the four walls of the classroom is unacceptable. It may be done with good intentions but children must be allowed to play at home and in school under supervision. Dangerous: Hanging onto a barbed wire fence! Children learn about hazards and how to keep themselves safe only through experience. One or two incidents of this nature should not block them from learning such life skills. Experience enables them become familiar with harmful objects and the need to keep away from them. Another aspect is that children play with harmful objects since there is no sports equipment available. Schools must ensure that the sports room where children can get sports equipment to play and return. In other countries this is the practice, chances of children playing with hazardous equipment is minimal. School Development Societies can fund such projects if state assistance is lacking. One excuse trotted out by teachers for restricting children from play are the over-size classes. In certain popular schools, the number of students in a class exceeds 50. Teachers have to cope with generally 10 per cent of hyperactive children in a class. 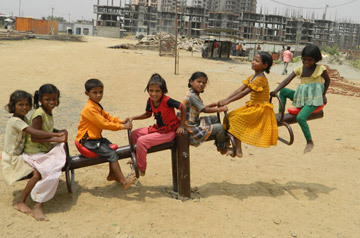 So 45 normal children and five hyperactive ones, in a play ground managed by one teacher is no easy task. This is an area education authorities must focus on. While the syllabus needs to be reduced to give teachers more freedom to accommodate play time, there has to be a way to reduce her burden of looking after a big class single handedly. Further, the school authorities must undertake an internal inspection round once a week within and around the school to locate hazardous places and equipment lying around. Public Health officials visit schools to inspect buildings, wiring, and other dangers once a year but that alone is not enough, schools must do it frequently. Parents must make safety of children and creating a safe environment in school, their responsibility as well. If there are items that can put children's safety at risk such things must be immediately removed without hesitation or someone must be entrusted with that task. Large schools with over say about 6000 students must devise indigenous plans for each sectional head to be responsible for their environment, to keep their area child proof, for instance class rooms, garden and play area. Principal, Deputy Principals and the sectional heads must undertake inspection tours in the school environs everyday at random. This is critical to protect children. A school health club concept has been implemented in some schools. One of the objectives of these clubs is to have a trained first aid response team in the school. Our target is to have at least one student with training in Cardio respiratory resuscitation, in each secondary class but this is yet to be achieved. Another disturbing issue is that since 2006, health has become a basket subject. Sixty per cent of students choose health as their basket subject but of late Information Technology has gained popularity relegating it to 40 %. When IT facilities in schools being further improved, we expect a lesser number of students to choose health as a subject. As a result health literacy of students will drop significantly and the result will be disastrous. I believe health is a critical subject that needs to be taught early so that children will grow up with healthy habits. The effects of this short- sighted decision will be felt in ten years. Already the rate of non communicable diseases such as diabetes have reached epidemic proportions and heart disease among young adults are increasing. Investment in education will be futile if the nation is ailing. What is the use of an engineer or chartered accountant if he is handicapped by disease? "School Health Unit is one of the ten units under the purview of the Family Health Bureau of the Health Ministry which is entrusted with protecting Maternal and Child Health. The School Health Unit is responsible for guiding schools to improve health in schools. In the aftermath of the grievous accidents that occurred in Panamura Maha Vidyalaya, Embilipitiya and Ananda College, Colombo the Education Ministry's Sports Unit Director has issued a circular last week with guidelines to ensure the safety of students who take part in sports, by standers or students merely playing in the school ground. The Ministry Director in Charge of School Sports B.A.Abeyratne said the circular will be issued to Zonal Directors and Provincial Education Secretaries to convey its contents to all state schools under national and provincial level. "Due to such unfortunate accidents which could have been prevented, parents fear sending children to take part in sports activities in school. This is unfortunate given that sports activity and play lay foundation of their childhood development." "In the light of this it is vital that schools authorities strictly adhere to safety precautions during sports meets," he said. National Child Protection Authority (NCPA) Chairperson Anoma Dissanayake said the NCPA will discuss with the education Ministry a mechanism to delegate responsibility to ensure child safety during school hours. Speaking about the unfortunate accidents which occurred recently in two schools and, in the aftermath of the sudden accidental death of the nine-year-old student of Ananda College two weeks ago, she said this responsibility should be delegated from the school authorities right down to staff members, prefects, older students and parents.
" Actually we are seeking serious measures to be taken by school authorities to ensure the safety of children during school time," she said emphasising that from the time a child walks into school until the time he or she leaves the premises,schools will have to guarantee the child's safety".